When it comes to your engagement ring making a bold statement about the divine love you and your partner have for each other, consider showcasing your precious gem in a Halo setting. A halo engagement ring has a center stone encircled by several smaller pavé stones that create a “halo.” A popular style during the Art Deco period, it remains one of the more popular settings for engagement rings trending today. Undeniably the most famous engagement ring in modern history is the one worn by the late Lady Diana Spencer, later known and loved as Princess Diana. It’s said that after Prince Charles proposed to her, in 1981, Diana — not Charles — selected the ring herself: a brilliant blue sapphire, encircled by a halo of tiny diamond solitaires on a white gold band. It was the same ring that, nearly 30 years later, Prince William presented to Kate Middleton when he proposed and sealed her fate as England’s future Queen. And spurred a renewed love affair of brides to be the world over with the Halo. In nature, the halo is an optical phenomenon appearing as an iridescent ring around the sun or a full moon, caused by their light passing through ice crystals high up in our atmosphere. Another type of halo is the corona, like the one produced by the recent eclipse in its totality when the moon completely covered the sun and appeared as a pitch-black disc encircled by a sparkly-white circumference of light. And as the moon continued its passage, an orb of light emerged from its edge. Taking a cue from the lapidary world, astronomers call that phase of the eclipse “the diamond ring” — breathtaking beyond words! No wonder artists throughout the centuries have used the halo to depict saints, prophets, and celestial beings with a circular aura around their heads. And that jewelers, inspired by nature and divine art, favor the Halo setting, which typically encircles a round, oval, pear, or cushion-cut center stone with tiny pavé diamonds or other gemstones that emphasize its sparkle and heavenly light, and gives the effect of making the center stone appear larger. Halo settings aren’t always round, either. 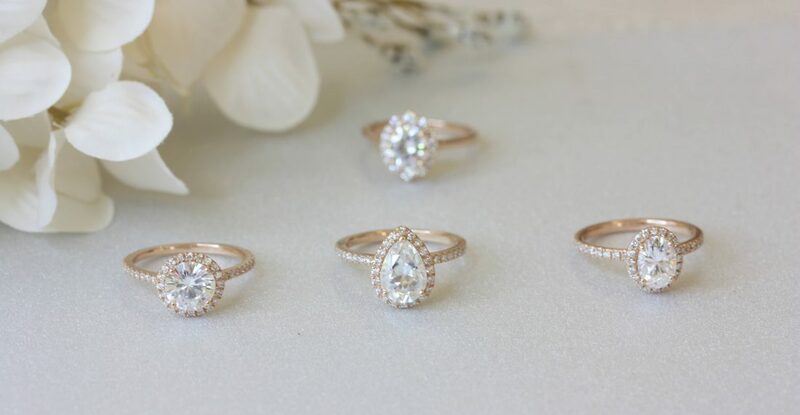 They can be fashioned to look like the petals of a flower or other whimsical shapes (like the points of a kite or a sail) that will give your engagement ring a vintage flair that’s uniquely your own. See more of our Halo engagement rings, worn by real-life brides to be, on our Rosados Box Instagram page!